President Xi Jinping's special envoy and Vice Premier of the State Council Zhang Gaoli will travel to Thailand to attend the funeral of King Bhumibol Adulyadej from October 25 to 27. Q: According to media reports, in response to the barring of Benedict Rogers, the Vice Chairman of the British Conservative Party's Human Rights Commission from entering Hong Kong, British Prime Minister Theresa May recently said that Britain has raised this issue at various levels in relation to Hong Kong and China and will continue to do so. What is China's comment on this? A: Hong Kong is a special administrative region of China, and the Chinese central government is responsible for Hong Kong-related foreign affairs. The central government of China and the government of the Hong Kong Special Administrative Region handle the relevant issues in accordance with law. It falls within China's sovereignty to determine who is allowed to enter the Chinese territory and who is not. The Chinese side has summoned an official from the British Embassy in Beijing and lodged stern representations with the British side about the series of irresponsible remarks recently made by it on this issue. I would like to stress that Hong Kong's affairs belong to China's internal affairs and the Chinese side will by no means allow any foreign government, organization or individual to interfere in China's internal affairs in any form. Q: On Thursday, the EU summit approved the new measures imposed on the DPRK, including a complete ban on investment in the country and a total embargo on oil and petrol products, which will go beyond the sanctions imposed by the UN. Do you have any comment on that? A: We have said many times that the Chinese side is always opposed to the unilateral sanctions outside the framework of the resolutions adopted by the UN Security Council. Currently, the situation on the Korean Peninsula remains highly complex and sensitive. All relevant parties should strive to ease the tense situation and create enabling atmosphere and conditions for them to come back to the track of resolving the issue through negotiation. All relevant parties should make concerted efforts to avoid provocating each other. We hope that all relevant parties can act prudently. 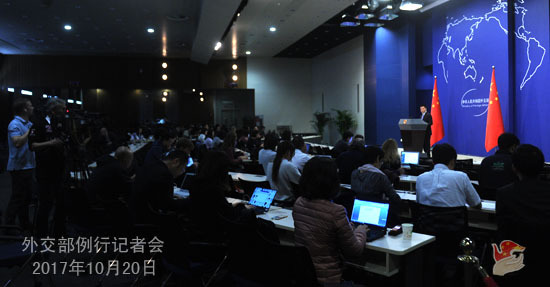 After the press conference, the following question was asked: yesterday, President Vladimir Putin spoke highly of the 19th National Congress of the Communist Party of China (CPC) at the annual meeting of the Valdai International Discussion Club. What is your response to this? 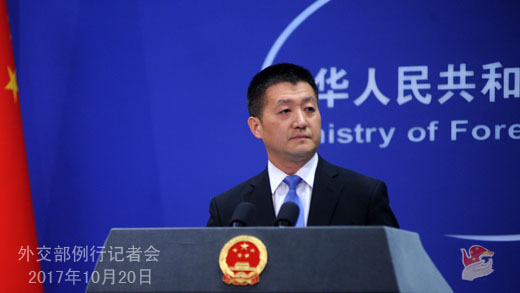 Spokesperson Lu Kang said he has introduced before that the Chinese side has received messages and letters of congratulation on the 19th National Congress of the CPC from many countries' political parties and leaders. We have also taken note of the positive remarks made by President Vladimir Putin on the 19th National Congress of the CPC and we extend our thanks for this. Under the guidance of the strategies put forward by President Xi Jinping and President Vladimir Putin, the China-Russia comprehensive strategic partnership of coordination has been operating at a high level with a sound momentum of growth being maintained in the bilateral relations. We cherish the friendly relations between China and Russia and believe that the China-Russia friendly cooperation can play a more positive role under the current international situation. Follow-up: President Vladimir Putin also said that he and President Xi Jinping are friends. Does the Chinese side also think so? A: Of course, the heads of the two states always maintain a sound working relationship and personal friendship.